Living a bit north of Boston is a blessing and a curse. I love the access to great restaurants, but sometimes it can be tough finding something of that quality a little closer to home. Finally, though, there are some great spots popping up north of the city including a great Italian restaurant called Evviva Cucina. Living a bit north of Boston is a blessing and a curse. I love the access to great restaurants, but sometimes it can be tough finding something of that quality a little closer to home. Finally, though, there are some great spots popping up north of the city including a great Italian restaurant called Evviva Cucina. At the helm in the kitchen is Executive Chef Anthony De Palma, who made his bones in all manner of great kitchens (working alongside the likes of Jim Dodge, Chris Douglas, Gordon Hammersly, Chris Slesinger, and Jody Adams), and his skill and passion come across in the great food at Evviva. I had a chance to speak with Anthony about his passion for cooking, how he came up in the industry, and his (slightly-gory) personal food memory. Behind the Pass: Where did your passion for food come from? Anthony Depalma: That’s definitely a pretty easy one. I grew up in a very peasant style Italian family. My dad, my grandparents all came over from Italy, just outside of Naples. As far back as I can remember, my whole life revolved around food. My grandmother was a fixture in the kitchen. Having my grandparents living next door to me as a child, I got to see them every single day. It was definitely going back to my family heritage and to this day, I still utilize a lot of those skills I learned about thirty, thirty five years ago. BtP: How involved where you when you were a kid in the cooking process at home? Or was it primarily just kind of watching and eating? AD: I think it became kind of a family affair for us. It was our time to be as a family. I was in the kitchen all the time. Making meatballs and learning how to cut chicken. I was probably seven or eight years old when I learned how to hold a knife. BtP: So at what point did you really start to think that this could be something that you could do for a career? AD: I started through high school. This is going back to one of my first summer jobs I had, it was washing dishes at a place where my dad had lived on the Cape. Started out probably around 14 years old. I was able to work in kitchens like that. But I got to college–I left Massachusetts and ended up in Colorado for two years at CU Boulder and I realized I was working my tail off having to pay for school while cooking at a resort up near Copper Mountain to pay for college. So, I had a chef there that kind of influenced me at the time to make the decision to go to a culinary school. After two and a half years out in the Mid-West, I transferred back East and and entered culinary school up in Essex, Vermont. BtP: What was your culinary experience like as far as going through school? AD: The formality and the structure I think kind of helped build that backbone of what was to come. The intensity of the program I think kind of weeded out the people that really didn’t want to be there. I got into the program and knowing that the end result was to someday become a chef, it was something I thought about for five, six years prior to being there. The intensity of the school; the long days, the long hours, bakeshop starting at three o’clock in the morning. It was real life experience. When you finally got out and you’re working 14 hour days and you’re making six, seven buck an hour back then it kind of digs through the riffraff and the cream kind of floats to the top. BtP: So if somebody came up to you and said, “Hey, I want to do this for a career,” what would your advice to them be? If learning the basics and the classic fundamentals of what we do everyday is part of their goals in life, by all means, a culinary program is fascinating. You’re going to learn a lot more than just how to cook a chicken. You learn the theory, you learn the fundamentals, you learn the history. I think that’s what kind of separates cooks from line cooks and supervisors from chefs. BtP: Obviously even if you’ve been through culinary school there is a lot you can learn from the chefs you work for. Can you talk about how important it is to have that kind of mentoring from chefs and people who’ve been in the industry for a while? AD: Absolutely. The transition of the industry from twenty years ago to today, from what the Food Network and the media attention has done for the industry is just spectacular. I think knowing that there’s chef instructors out in the world when you get out of culinary school that can help guide you through the turmoil, the trials and tribulations of what’s going to happen is an amazing thing. When you have that professional experience, and people like Jim Dodge, Chris Douglas, Gordon Hammersly, Chris Slesinger, they all started together and they all branched off together and kind of helped form what we have today. People like Jody Adams, when she walks into a kitchen, the amount of respect that’s held there. These are all chefs, but they’re all cooks. They’ll pull you off the line in a second, and take over your station just so you can really understand just what it takes to do this, and how to do it. They’re involved in culinary programs, they’re involved in university training. Every day, you’re learning something when you come to work, and I think that’s what’s so unique about our industry. BtP: So, I think the last question I have for you, because obviously you’ve been involved a lot with food your entire life and probably have a ton of memories you’ve made along the way, what is your favorite food memory? AD: I talk about this all the time, and sometimes it kind of makes people’s stomach turn, but as a child growing up my grandparents lived next door. They had a half-acre farm with vegetables growing and we had chickens running around and goats and rabbits. As a child, I always thought those were our pets and I felt so awesome that I was the one kid in school that had all these animals running around. I was probably seven, seven and a half years old, when I finally realized that those pets were pets only until they came to the dinner table and they became our meal. There was one day when my grandparents weren’t answering the door after school and I was all nervous and looking in windows, and I looked into the basement window and the laundry room and saw a white bunny hanging upside down on a clothes line. I freaked out; I was trying to break the window. I was like, “That’s my bunny!” There’s blood everywhere, and I didn’t want to eat for like two weeks. So my dad sat me down and was like, “This is just part of life.” It’s how we grew up and we raised the animals. I was wondering why we had thirty chickens at one point and all of a sudden, we were left with four. Those memories, most of my food memories come back to grandmother and grandfather in the kitchen night and day. Making meatballs, making all different types of pastas, but the animal part of the table really made it come to life for me probably thirty five years ago. I share that with all my cooks, how we fabricate and break down whole animals. It’s a passion that going back to Jim Dodge and Chris Douglas and Jody Adams. When you can come to work and you’re learning something everyday, it just makes coming to work that much more enjoyable. For me, we touched on it a little bit in the beginning, this isn’t work for me. It’s my life. So, seventeen hours a day, even though I spend more time here than with family, it’s just part of my passion for what we do. It’s truly unique. 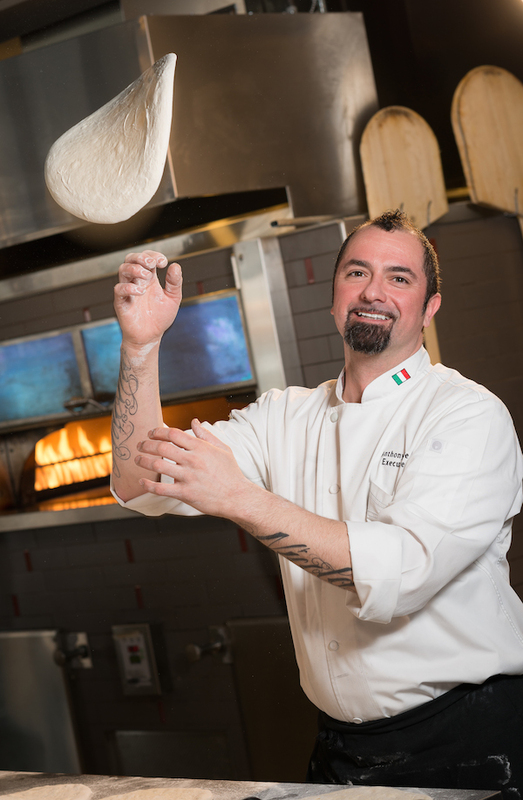 Anthony De Palma is the Executive Chef of Evviva Cucina located at 7 Cornerstone Square, Westford MA.